What is the Best Price for that Used Ram Truck or Promaster? such a large investment like a truck or work vehicle. 3) not buying the right vehicle for their needs. But mostly, you are probably worried about price, and making sure you’re getting a good deal when looking to buy a pre-owned car, truck, or suv. You probably did a ton of research online looking for a pre-owned vehicle already, or maybe you are just getting started. current market value. 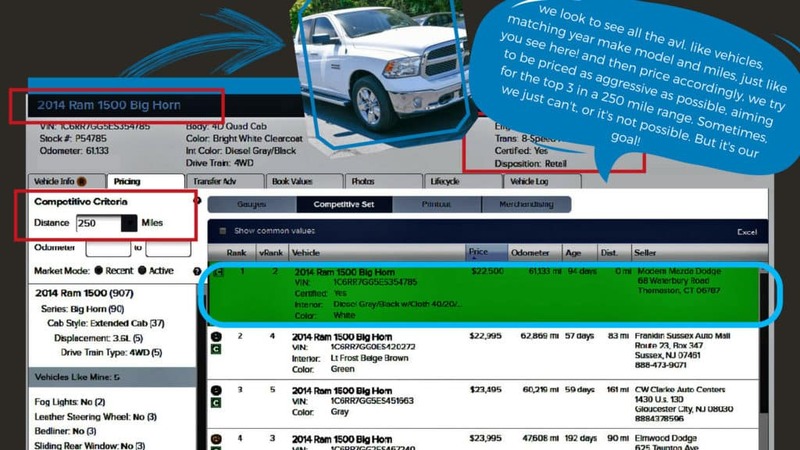 Meaning, the vast majority of dealers are pricing their used vehicle inventory based on the live market. all the used cars on the internet so that we can assess transparently what the best price for a specific vehicle might be. So I haven’t really answered your question yet, have I? miles on the vehicle, and whether or not the particular vehicle can be certified. What’s the best price for a 2014 Ram 1500 Big Horn Extended Cab with a 3.6L V6 with 61,133 miles that’s been manufacturer certified? As of the day this post is written, going out looking in and outside of our market there are only 6 of these Ram Trucks! other like 2014 Ram 1500 Big Horns with like equipment within a 250 mile radius. This way, being the lowest isn’t a scheme, it’s just good business. taking mileage and additional trim level or packages into consideration. the right person who needs this truck for their lifestyle or work needs. 0 comment(s) so far on What is the Best Price for that Used Ram Truck?